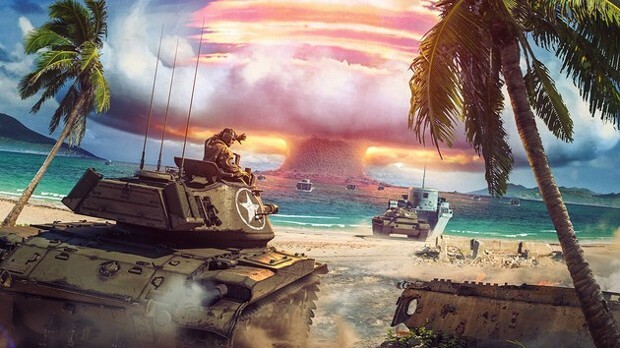 The next console update to come to Wargaming’s World of Tanks takes players into the Cuban Missile Crisis. Titled “Kennedy’s War”, the update focuses on the Kennedy administration’s post-Bay of Pigs response to Khrushchev establishing a base just a stones-throw away from Florida, in Cuba. Players take part in Kennedy’s bid to stop Khrushchev by making use of the Guantanamo base as a staging ground for US troops. They’ll take command of the US Army’s SCT Dale Reece and pilot the 2506 Tank, a variation of the M41 Bulldog exclusive to the War Stories pack. The update is slated for release tomorrow, on Playstation 4, Xbox One, and Xbox One X at launch. More details are available on the World of Tanks site.